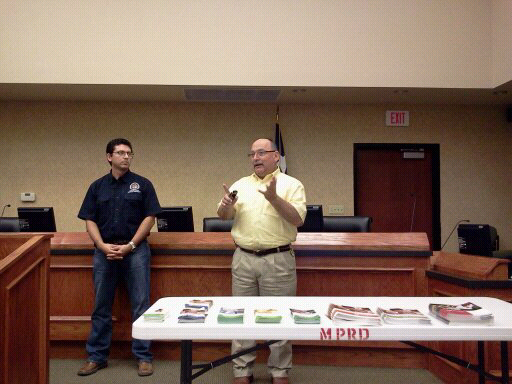 DENTON, Texas -- Individuals and their families are urged to “resolve to be ready” this hurricane season. The Federal Emergency Management Agency’s (FEMA) Region 6 office has launched a new hurricane preparedness website to help you accomplish that goal. The website features facts about the 2011 hurricane season, as well as tools to help you execute crucial preparedness tasks such as assembling an emergency kit, formulating an individual and family plan and staying informed. You can visit the FEMA Region 6 Hurricane Preparedness website by logging onto www.fema.gov/about/regions/regionvi/updates.shtm. transferring the duties over to the elected Public Utilities Board,"
chambers and move it on to the Governor for signature." that we continuously experience in South Texas," Senator Juan "Chuy"
hundred votes in the Texas House of Representatives." "On behalf of the citizens of McAllen, I thank Senator Juan "Chuy"
transfer of the district's obligations, liabilities, and assets. The Greater Mission Chamber of Commerce and UTPA Small Business Development office presented a seminar on what small businesses can do to prepare themselves for and what they can do to ensure a quick recovery after one. 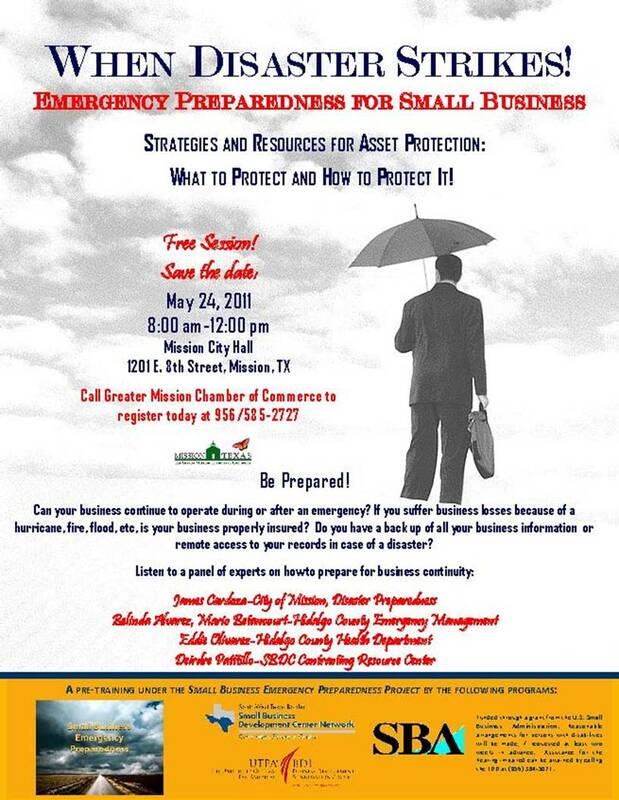 It is important to note that roughly 40% of small businesses do not reopen after a major disaster. 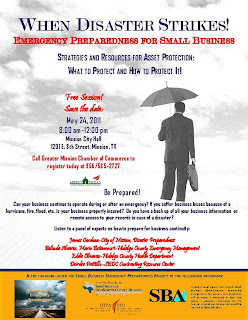 Less than 30% of small businesses report having a plan for emergencies. The odds are that your small business, or one that you frequent, may not survive a catastrophe without a plan. One thing you can do to prepare is to talk to your first responders so they can help you prepare. One aspect of their jobs that has changed over the years is that they spend a lot of time educating the public. They can help you develop a basic needs assessment that you can refine. The day of an emergency is too late to consult with your first responders. Also, don't forget to let your police department know about your business in case they need to contact you for any reason. Another good tip is that businesses should not let go of old fashioned wired telephone lines. Mobile towers go offline or get saturated during emergencies. Landlines continue to work, even when power goes out. In terms of insurance, you need to insure what you do, not just what you have. When it comes to property, you must insure the capability of your assets, not so much the market value. Plan not just to replace stuff; plan so that you can continue in business no matter what happens. There are many things you can do to prepare for disaster and for a quick recovery. 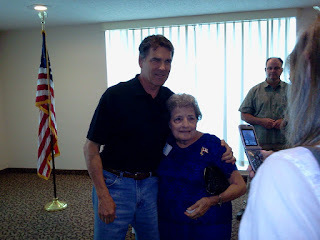 You can find out more at http://www.ready.gov and at http://www.texasprepares.org. 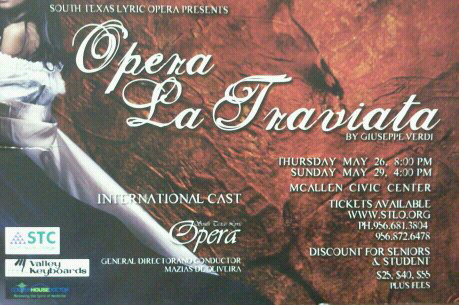 at (956)585-2727. All events require pre-registration as all sessions are subject to change. in emergency situations such as natural disasters or national threats. efforts to keep border communities safe.